WAFFLES: Hey Boss! You're not playing with that fetch toy are you? KATIE: You mean this toy right here? Right next to me? The one my whiskers are already touching? You mean that toy? WAFFLES: Uh... yeah? I mean, it's not like you're chasing it or anything. KATIE: Or anything? How do YOU know I'm not doing anything with this toy? WAFFLES: You mean THIS toy? KATIE: *sigh* Is NOTHING safe from your sticky pink paws? WAFFLES: Uh... that would be a 'no'. "Waffles Plays Fetch... With Katie"
Don't bother with the popcorn and soda, it's only 14 seconds long. If you can't see the video below, click HERE to watch on YouTube. 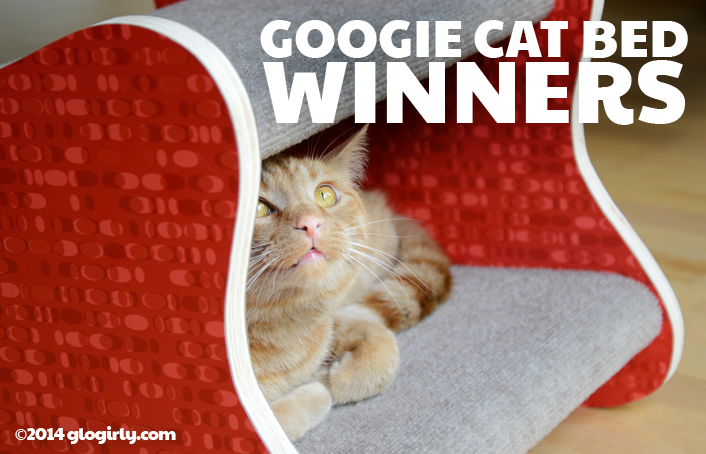 We're very excited to announce the lucky winners of our Googie Cat Bed Giveaway! BIG congratulations to Linda S. and her trio of furry felines - Koneko, Arata & Moko! You guys are going to need to make reservations... or get REALLY chummy inside! Glogirly made a special stop over at our favorite cat shelter, Feline Rescue, with a very special donation. Glogirly and the Googie Man (not to be confused with the Boogie Man) donated the Googie bed we tested out here in the Townhouse. We're certain the shelter cats will enjoy LOTS of napping and playtime in this beautiful bed during what we can only hope are short stays before they find their forever homes. Waffles did you ever think to fetch the boss some salmon? Well naturally his pink paws are sticky...it's all the MAPLE SYRUP! What an idea Waffles! Get Katie some shrimp and she might even like you! Our straws like that have been stolen by the new little whippersnappers. It's always the young'uns causing the commotion, isn't it, Katie? Oh, those sticky paws! My orange Jack is scared of those straws (and his own shadow). Katie, get that straw back! That video is not long enough! :( I can't get enough of Katie and Waffles!! Congratulations to the trio of kitties and the shelter for getting that awesome bed!! Maurice likes to play fetch. Da only thing I wanna fetch are foodz. Wow! Waffles, you made my head spin in that video! 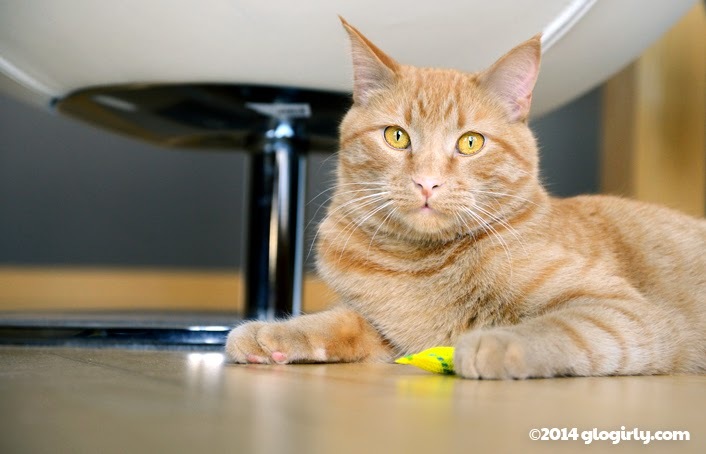 Concatulations to the Googie cat bed winners - and to Feline Rescue! Congrats to all the winners! We love the video! Concats to the winners! Freya wants to know if you play fetch with her favorite toys: fuzzy sockies, springs, and the rollers that come in the core of dog poop bag rolls. Those are the favorite fetch toys here! The bed is on its way to us and I can't wait to see how my bunch will like it. I suspect Arata will be the first to test it and will be the one to use it the most, too. Thanks again for the great giveaway, Glogirly, Waffles, and Katie! Great game of fetch, Waffles! And concats to the winner of the bed and how wonderful you donated yours to Feline Rescue. Congrats to the winner. That was some good fetching Waffles. 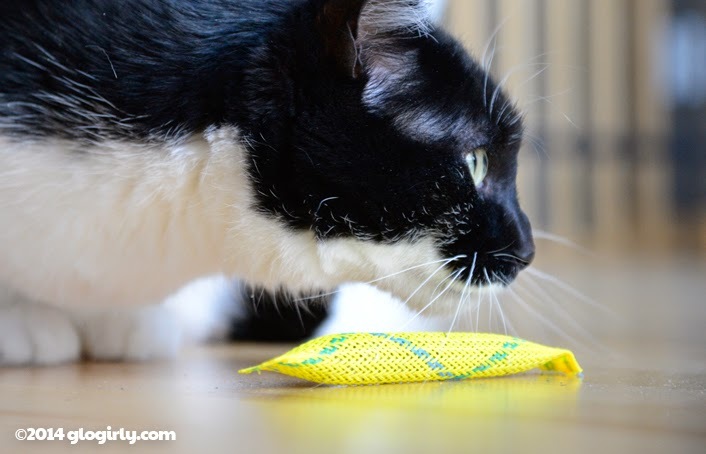 Sigh...I love a cat that plays fetch--on his terms, of course! Haha, love the last frame with Waffles pointing with his paw! Concats to the winners! Wow Waff..you are one fast kitty..I want to see more of that action..Concats to the winners and shelters..Linda..Your kitties are purrty!! Yea Waffles! My cats think fetching is one of the many services humans do for cats. that video was just great! Waffles is a maniac! MOL! Concatulations to the winners of the bed, boy are they going to be happy! Concats to the winner!!! Loved that video Waffles!!! Ummm... I think that maybe you need TWO of those yellow toys. We love your fetch game, Waffles! OUr previous generation of cats would fetch the foam balls, but none of us can be bothered to bring toys back. We expect the humans to do the fetching! Waffles, you ought to try that. We're sure Gloman would fetch for you, if you hold out long enough. YAY! 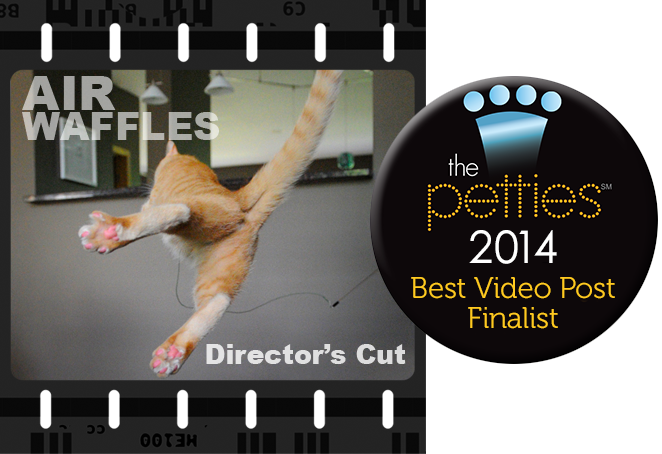 Concats to the winner AND the shelter - AND to Waff on his MAD fetching skillz! Great fetching skills Waffles. Sorry Katie, nothing is safe from a young mancat.....just ask anyone who lives in this house! Concats to the winners!